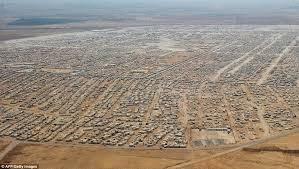 AMMONNEWS - The wife of Japan's prime minister Akie Abe, Tuesday visited the Zaatari Refugee Camp on Saturday and had a first-hand look at the conditions facing Syrians, as well as burdens borne by the Kingdom triggered by hosting massive numbers of displaced people. During the tour, Akie was briefed on the basic humanitarian and aid services Jordan offers to the refugees and efforts exerted to improve their livelihoods. Moreover, she also visited the Makani Center, an approach initiated by UNICEF aims to provide the most vulnerable children with opportunities for self-development, including alternative education services, psychosocial support and life skills training. UNICEF Jordan Representative Robert Jenkins presented a briefing on the programs and trainings the center offers for the children and youths alike. The Prime Minister's wife also distributed gifts to women and children.